View More In Wine Stoppers & Pourers - Page 2. 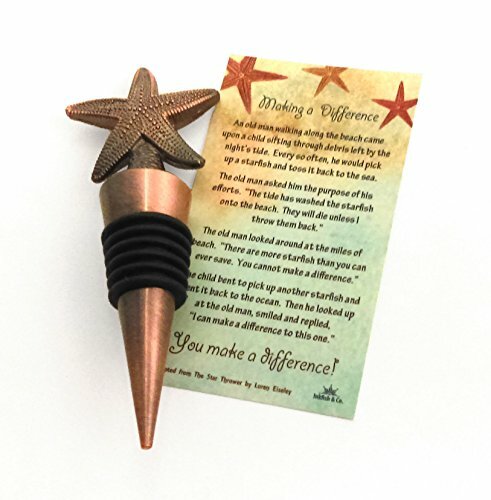 Antique copper starfish bottle stopper presented in a drawstring burlap gift bag with enclosure telling the Starfish Story about making a difference. SHOW Your Appreciation with this MEANINGFUL Gift for Someone Special who goes out of their way to make a difference. WRITE Personal Message on Back of Gift Card or leave blank. Cards are the size of a business card and easy for someone to carry in their wallet as a remembrance of their gift. If you have any questions about this product by Inkfish and Co., contact us by completing and submitting the form below. If you are looking for a specif part number, please include it with your message.